HMH Books for Young Readers, 9780544671720, 224pp. It all begins with a strange coin on a sun-warmed sidewalk. Jane finds the coin, and because she and her siblings are having the worst, most dreadfully boring summer ever, she idly wishes something exciting would happen. And something does: Her wish is granted. Or not quite. Only half of her wish comes true. It turns out the coin grants wishes—but only by half, so that you must wish for twice as much as you want. Wishing for two times some things is a cinch, but other doubled wishes only cause twice as much trouble. What is half of twice a talking cat? Or to be half-again twice not-here? And how do you double your most heartfelt wish, the one you care about so much it has to be perfect? Alice Hoffman is the author of many books for children including Aquamarine, Green Angel, and Nightbird. Her books for adults include Practical Magic, The Museum of Extraordinary Things,The Dovekeepers and The Marriage of Opposites. 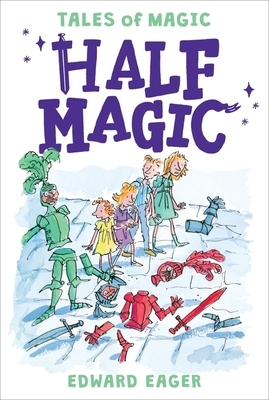 Half Magic is her favorite book for children and Edward Eager is her favorite children’s book author.